iPhone 8 and iPhone 8 Plus Finally Come to Light! iPhone 8 has been playing hide and seek with Apple stalwart fans that it makes its buffs guess its debut in 2016, but later it leaves the clue for its followers to anticipate its arrival in 2017. Well, in September, 2017, the world-anticipated iPhone 8 will eventually comes to the scene. Waiting for iPhone 8 big surprises, Apple fans eye down iPhone 8 display, screen size, processor, etc. The baking-hot iPhone 8 says hello to its genuine fans with 5.5 inch iPhone 8 and 5.8 inch iPhone 8 Plus, which go head to head with resolution up to 2800 x 1242, and advanced iOS 11 accompanied with Apple A11 chipset (64-bit). It's quite convincing that no matter iPhone 8 or iPhone 8 Plus you purchase, any one can bring you with an unprecedented multimedia experience. No matter what new changes iPhone 8 makes, one feature it can't get rid of is that it still has the file format limitation. To be specific, iPhone 8 and iPhone 8 Plus can solely support MP4, H.264, QuickTime MOV video. Therefore, if you are ravenous for converting AVI, FLV, MKV video to iPhone 8 for playback, converting these videos to iPhone 8 supported video formats is a must. To convert video to iPhone accepted video formats, one vital thing you need to do is to resort to a reliable yet big-league video converter. When it comes to superb tool capable of fast transferring video to iPhone with possible highest quality, MacX Video Converter Pro is of the first water. MacX Video Converter Pro can easily convert SD (AVI, FLV, MP4) & HD (MKV, MTS, AVCHD) video to iPhone 8 just in a fraction of mins and meanwhile reserve the maximum high quality without any third party assistance. Still, it's but a trifle to download and convert YouTube video to iPhone 8 for offline watching. With this video transcoder in hand, you enable to download YouTube music video at barely 30 seconds. Unbelievable, right? Step 1: Load Video file. After free downloading video converter for iPhone 8 on your Mac, run it. Click "Add File" button to load the video file you want to convert to iPhone 8. This video pro can also support to convert video to iPhone 8/Plus at batch. You can choose different formats for different files. Here we choose MP4 as output format from the format list. 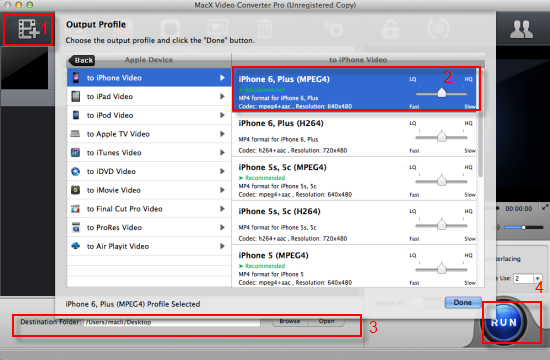 You can also choose to convert video to iPhone 8 supported formats like converting video to H.264, MOV, etc. for playback or uploading. Tips: The "Edit" button on the main interface is also available for you to trim your recordings, crop them to suit your device's screen, add watermark and even plug in SRT subtitle to MP4 video to make video more understandable. Step 4: Start Converting Video to iPhone 8 on Mac. Click on the "RUN" button and the converter will transfer video to iPhone 8 in MP4 file format in a few minutes. Then you can enjoy video on your iPhone 8 for watching anywhere anytime. Note: Beyond converting video to iPhone 8 (Plus) with blistering speed, this smashing Mac video converter also equips itself with screen recorder, slideshow maker and powerful video editor, whereupon you are allowed to record a tutorial for sharing on YouTube, share your photo slideshow with your friends, customize your video at your will. Here is a list of the top free Mac video converting software for you to convert among HD and SD videos on Mac OS,like mkv to avi, AVI to mp4 etc; and convert video to your iPhone, iPod, iPad, do not miss this to convert video free with best free video converter for Mac. Best iPhone 7 video transcoder to easily convert videos to iPhone 7 (iPhone 8/Plus iPads Android included) in 1080P, 4K 2160P, 8K 4320P MKV, MTS, AVI etc with top quality and 83 x faster speed. Also iPhone 7 video download in HD MP4 from 300+ sites is allowed.